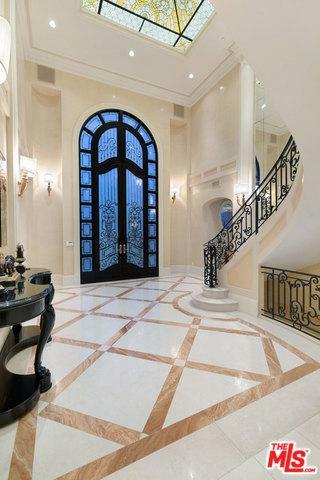 REPLETE WITH CRAFTSMANSHIP OF ANOTHER ERA, THIS EXTRAORDINARY 3-LEVEL GATED FRENCH TRADITIONAL ESTATE ILLUSTRATES ELEGANCE IN EVERY ASPECT. CUSTOM BUILT BY ITS OWNER AND COMPLETED IN 2008, THE HOME IS LOCATED ON A COVETED CENTRAL FLATS' BLOCK MOMENTS FROM BEVERLY HILLS' FAMED GOLDEN TRIANGLE. SUNLIT SPACES WITH SUPER HIGH CEILINGS, FRENCH DOORS, WOOD & MARBLE FLOORS, AND MOULDINGS. CONVENIENT ELEVATOR ACCESS TO ALL THREE FLOORS. 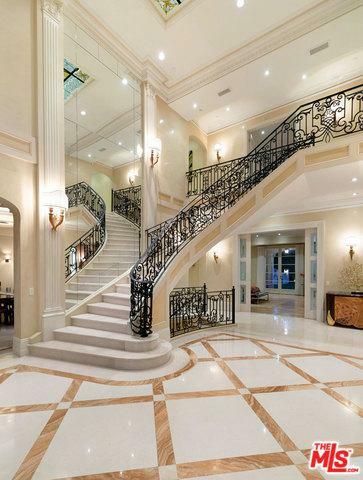 DRAMATIC 2 STORY SKYLIT ENTRY WITH SWEEPING STAIRWELL. GRACIOUS LIVING, DINING, AND FAMILY ROOMS. SEPARATE LIBRARY/OFFICE. 4 BEDROOM SUITES UPSTAIRS INCLUDING A HUGE MASTER WITH SITTING AREA, BALCONY, FIREPLACE, DUAL BATHS/WALK-INS. 2 SUITES ON THE LOWER LEVEL ALONG WITH A PROFESSIONAL SCREENING ROOM, WINE CELLAR, AND GAME ROOM. STUNNING CENTER-ISLE KITCHEN OVERLOOKS PRIVATE GROUNDS WITH LAWNS, POOL, SPA, BBQ CENTER, PATIOS, AND MATURE HEDGING. 4 CAR SUBTERRANEAN DIRECT-ENTRY GARAGE FOR PRIVACY AND SECURITY IN ADDITION TO TREMENDOUS OFF-STREET GATED PARKING. Listing provided courtesy of Michael Libow of Coldwell Banker Residential Brokerage.